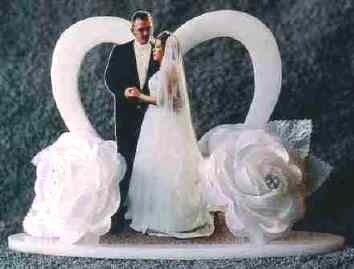 A "Dearly Beloved" photo sculpture can be used as a cake topper, table decoration, and/or as a gift. 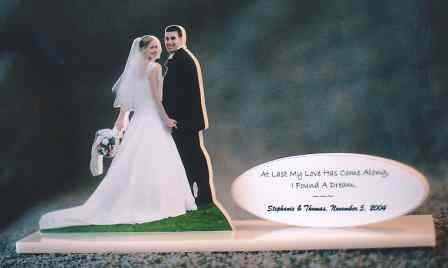 Each sculpture includes the hearts background of your choice with a 4x5 or 5x7 cutout of the bride/couple and a graphics piece, if you wish. You can then add flowers, ribbon or your own touches to follow a color theme. 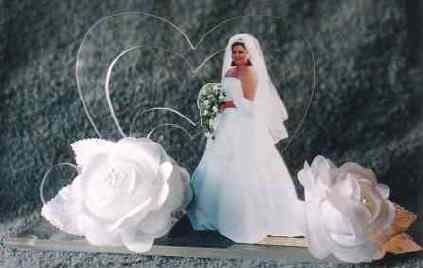 Rectangle or oval bases and hearts usually created in white or clear acrylic. Used for anniversary parties too! "2 Hearts" is approximately 7"x 5". Can be created in white or transparent acrylic. Includes 4x5 or 5x7 photo figure. Can be personalized with couple's names/wedding date on lower heart. $40. A simple "cut-out" or "pop-out" make wonderful decor and/or gifts. 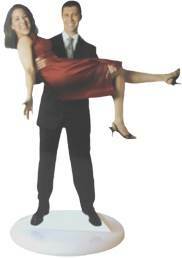 Shown here is a standard cut-out with graphics. Simple in design, but elegant. 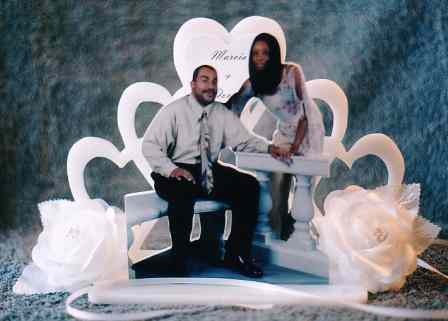 The bride & groom loved it. Now this is a personalized gift! for me were fantastic! So pleased. Thank you so much!"